Many companies don’t realize the many benefits of updating their warehouse lighting. Since they don’t realize the benefits, companies tend to neglect old warehouse lighting, content to leave it alone. This is a decision that forgoes all of the benefits that updated warehouse lighting from a company like WCI Electric could bring. 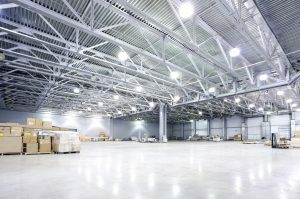 One benefit to updating warehouse lighting is increased energy efficiency. Older lighting consumes large amounts of electricity when compared to newer lighting designs. While switching just one or two bulbs might not make a difference, switching out all the lighting above a large warehouse floor can really put a dent in a companies electric bills. Depending on what you are switching from and to, upgrading your lighting can really improve your bottom line and lower your monthly overhead, improving profitability and competitiveness. WCI Electric will work with you to determine the best option for your particular warehouse lighting upgrade to save you money. Additionally, improved warehouse lighting can eliminate safety hazards. Employees working in a dimly lit building can very easily trip and fall over objects hidden in the shadows, or walk into objects sticking out of the wall or shelves. Proper lighting can eliminate a trip or fall, which on a concrete floor can end up being a fairly serious and costly injury. Further, improved lighting lowers the risk of a forklift driver not seeing another employee or object and driving over it. Forklifts backing into a person or object will surely do lots of damage, and improved lighting may help reduce the risk of such an accident occurring. When you work with WCI Electric, we will make sure that your entire warehouse is lighted properly to eliminate safety hazards associated with poor lighting. Another added benefit to updated warehouse lighting is improved employee efficiency. When workers are squinting in the dark to try to read labels or ensure their path to walk through is clear they don’t work nearly as quickly or efficiently. A simple upgrade in lights could save time on lots of routine tasks that employees perform regularly. On top of this, improved lighting can help workers locate products that were misplaced much quicker since they can see clearly all of the labels and pallets as they walk through your warehouse. To find out how WCI Electric can help improve your warehouse lighting please contact us today.